One of the biggest hassles faced by administrators while using services provided by cloud providers is the need to catch up with the latest release and stay up-to-date. This involves downloading the latest software and performing frequent upgrades. In an enterprise scenario, this means going through various level of approvals and wait time before you can make any changes. It becomes even more cumbersome if downtime is involved. Azure Site Recovery has a monthly release cadence where it makes enhancements to existing features or add new capabilities. Architecture reference shows when you enable disaster recovery of Azure virtual machines, a component known as mobility service agent gets installed on the VM. In order to avoid the overhead associated with upgrading the agents, users can choose to enable Site Recovery to manage updates for you. Once you enable automatic update, the Mobility Service extension gets updated automatically with every new release. What's the advantage? You no longer need to plan for deploying the new versions with every release, and automatic update doesn't require a reboot of your Azure Virtual Machines, nor does it affect on-going replication. How to enable automatic updates? When you enable replication for a virtual machine either starting from the virtual machine view, or from the recovery services vault, you will get an option to allow Site Recovery to manage updates. Under For Azure Virtual Machines-> Extension Update Settings, click the toggle to choose whether you want to allow ASR to manage updates or manage manually. Click Save. Once you allow Site Recovery to manage updates, a global runbook (which is used by Azure services) is deployed via an automation account, which is created in the same subscription as the vault. One automation account is used for a specific vault. The runbook checks for each VM in a vault for which auto-updates are turned ON and initiates an upgrade of the Mobility Service extension if a newer version is available. The default schedule of the runbook recurs daily at 12:00 AM as per the time zone of the replicated virtual machine's geo. The runbook schedule can also be modified via the automation account by the user, if necessary. For more details on automatic update, refer to our documentation. In addition to this, we recently announced a few capabilities that were top customer asks, and provides better control and security for your workloads. Cross-subscription disaster recovery for Azure virtual machines - You can now configure DR for Azure IaaS applications to a different subscription with in the same Azure Active Directory tenant. 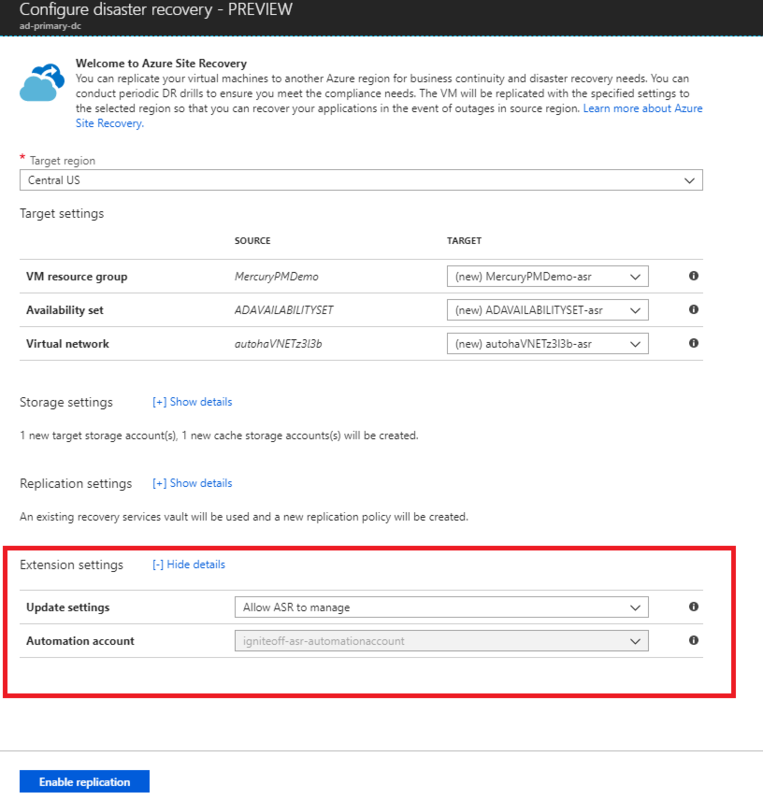 Disaster recovery for Azure Disk Encryption–enabled virtual machines - You can replicate virtual machines, enabled for encryption through the Azure Active Directory app, from one Azure region to another region. Azure natively provides you the high availability and reliability for your mission critical workloads, and you can choose to level up your protection, and meet compliance requirements using the disaster recovery provided by Azure Site Recovery. Getting started with Azure Site Recovery is easy – simply check out the pricing information, and sign up for a free Microsoft Azure trial. You can also visit the Azure Site Recovery forum on MSDN for additional information and to engage with other customers.